How to do smokey eyes? A question that seems to have such a complicated answer, however, when you have a makeup guidebook at hand, nothing seems to be impossible already! Smokey eye makeup is the style that every single fashioniser loves without exception due to the melancholy, mystery and femininity it features. Best of all, creativity has no limit, when it comes to smokey eyes, as you can mix and match different eyeshadow hues, combine different colors and styles and every time come up with a fresh new look that is unique, trendy and special. 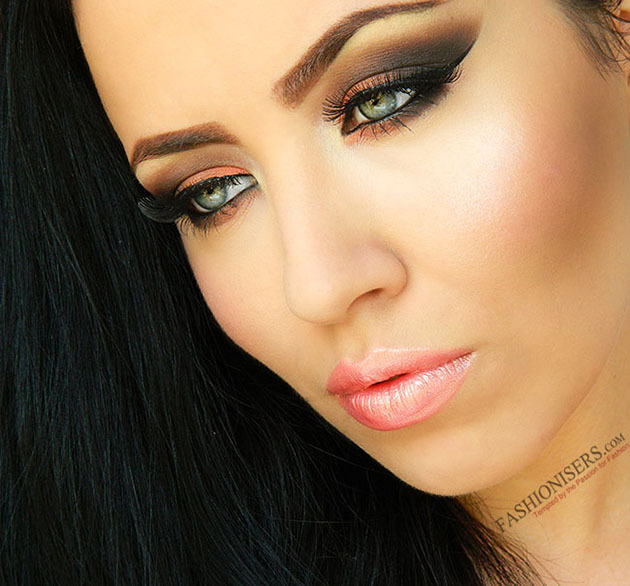 Exactly that special factor makes smokey eye makeup the loveable style among makeup junkies! From season to season, smokey eye makeup styles differ, just like the fashion and makeup trends and the mood every season brings with it. While in summer, you are welcome to experiment with brighter shades, creating daring, summer-ready smokey eyes, in fall, when colors automatically become muted and dull, you instantly become to love smokey eye makeup in warm, autumnal shades. Still in both cases, classic smokey eyes seem to be timeless! If you seem to lack new ideas on creating smokey eyes, have a nosey at the orange & brown smokey eye makeup tutorial below, ideal for the bleak autumn months! Once you have fetched all the necessary products for doing this fab smokey eye makeup look, let’s start the most enjoyable process: makeup application! Step 1: Start by prepping your face for the makeup, washing it and applying the makeup base. Spread the foundation all over your face with the help of a makeup brush. Use concealer on the areas, where you have some skin flaws to hide. Set your facial makeup with powder to make it last longer and have a mattyfing effect. Apply the bronzer and the blush correctly and you’re done with the basic step! Step 2: Contour your eyebrows properly, giving a divine shape and thickness to them. Step 3: Start your eye makeup by applying the primer and the base all over your lids. After you have primed your eyes well, apply an orange eyeshadow hue to the inner corner of your lid, hardly reaching the middle part. Step 4: Next to the orange shade, use a warm brown color, not completely reaching the end of your lids. Step 5: Now, apply a darker brown eyeshadow, creating a wing. Blend all the colors to the crease line with the same warm brown tone that you have used on the middle part of your lids. Step 6: Apply a black eyeshadow over the dark winged one on the outer corner of your lid. Blend it well to the crease. 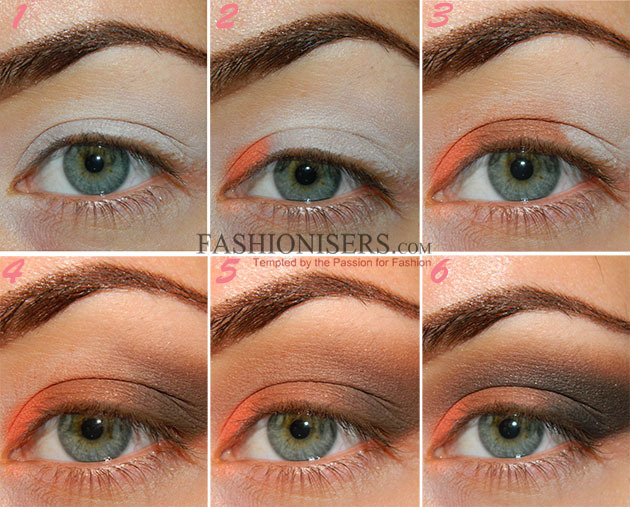 Step 7: Repeat all these steps on your lower lid, applying the same eyeshadow colors in the same sequence. Step 8: To the inner corners of your eyes and under the brows apply a highlighting eyeshadow to open up your eyes and make them bigger. Step 9: Apply a black eye pencil to your waterline and black eyeliner on your lids. 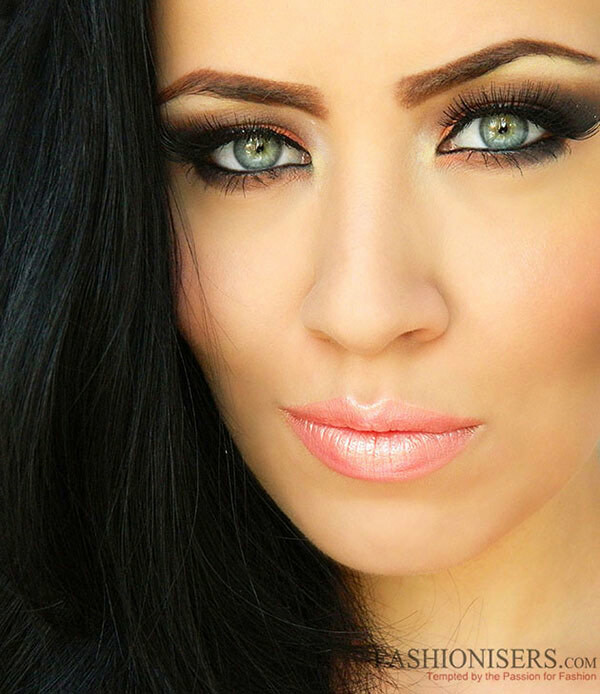 Step 10: Apply black mascara and false eyelashes to make your orange & brown smokey eyes more dramatic! Step 11: Create the perfect pout by applying a soft lipstick tone with a satin finish. Keep in mind not to use too bright lipstick hues here, since your eye makeup is already well defined! And here we are done with the orange & brown smokey eye makeup tutorial! You can wear it at a party or on a date to leave a deep impression on your beloved one! Don’t forget to come back for new, creative makeup tutorials!